STAR WARS: EPISODE VI – “REVENGE” RETURN OF THE JEDI, 1983. Original fully Folded Advance, Teaser, Recall, Re-titled, Revenge style 1 Sheet (27 1/8 x 41 1/8) Vintage Classic Sci-Fi Movie Theater Poster, Starring Mark Hamill, Harrison Ford and writer / executive producer George Lucas. Artwork by Drew Struzan. For all our <Star Wars> posters follow the link! There are 2 styles the dated and undated version. The undated version is more rare and valuable. there are <6,800 copies in the world Moviepostercollector’s.com. Time has destroyed many of them. 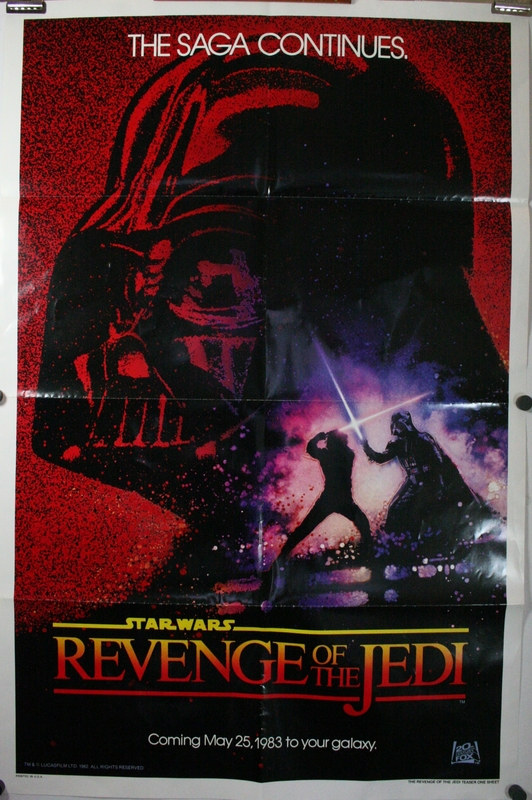 A fake Revenge of the Jedi poster can be identified based on 4 different factors; #1 size (see below), #2 cloudy bottom right corner, #3 fold lines in the printing, #4 GAU logo on bottom right isnt sharp or blue, #5 paper weight. Known experts have said that 1/8 to 1/16th of an inch of difference outside of the base 27/41″ is ok and is not in itself enough proof to a revenge poster being a forgery. Differences greater than this, should be considered fakes, reproductions or forgeries. A note on paper weight. An original revenge poster has a light weight and the paper seems to be thinner than other posters from this age. There are numerous sources of information on the internet about points #2, 3 and 4. Follow the link to Moviepostercollector’s.com for explanation about these other points. This poster is in very fine to near mint condition and does not have any major defects to speak of. The only minor defects are slight wear along the foldlines. This poster is a Guaranteed & Authentic movie poster. If for any reason you are not happy, full refunds are accepted (assuming there are no changes to condition). For a rolled version of this Revenge of the Jedi Poster, follow the link!